We (my teaching partner and I) are embarking on an inquiry that we hope will promote innovation, empowerment, risk taking, commitment, and skilled problem solving in our students. Using Fullan’s six elements of character as our framework we are attempting to measure the impact of focusing work on social and global issues on students’ ability to demonstrate the 6 C’s. We wanted the children to identify a need, to create a plan and then reflect on the outcome. It was December when we began this project, so it was the perfect season to embark in this journey. There was a food drive at our school for local families and we also had a Christmas tree in our front hallway that students and teachers decorated with hats and mittens for children in need. This was our first step in building empathy in our students. · What is it really like to live on just $1 a day? · How big of an effect could not having clean water nearby have on your life? · What kind of food can you afford on $1 a day and what does it really mean to be malnourished? · What options do the poor have to get back on their feet after a natural disaster? · What barriers do the poor face in finding work and how do they make a living? · How is it possible to budget just $1 a day for immediate costs like food and shelter and still save for long term items like your kids’ education and emergencies? · What prevents kids from going to school and how can education respect traditional culture while also teaching modern skills? We noticed that the students were very engaged in the content and were hungry for more. We invited Emily Hime has a non profit organization called Hime For Help. Emily opened and runs Maison Ke Kontan Children's Home in Port Au Prince where seventeen children currently reside. As well as running the Children's Home she also sponsors over ten children and families who are living in extreme poverty and gives these children an opportunity to attend school. She also supports a tent city consisting of 76 people where she provides clothing, food, and medical treatment as well as a remote village in the mountains of Montrouis where she personally sponsors a family of nine and provides care packages, medical care, clothing, and food for other Haitians in the village. Twenty two year old Emily Hime was gracious enough to come and talk to our class about her journey, her passion and why she is moving to Haiti indefinitely this February. someone from our local community to come in to speak to our students. Emily and the background knowledge we provided our students through read alouds, video and pictures ignited a spark in our students that was contagious. Students began bringing in spare change to send to Emily. They began brainstorming ways they could help Emily and her organization. This is where #kidscancreatechange came from. Our students want the world to know that even though they are young, they can create a huge impact. An impact, that can change the world. We want you to join us. We want you to prove that you don’t have to be rich, or famous, or old to make a difference. 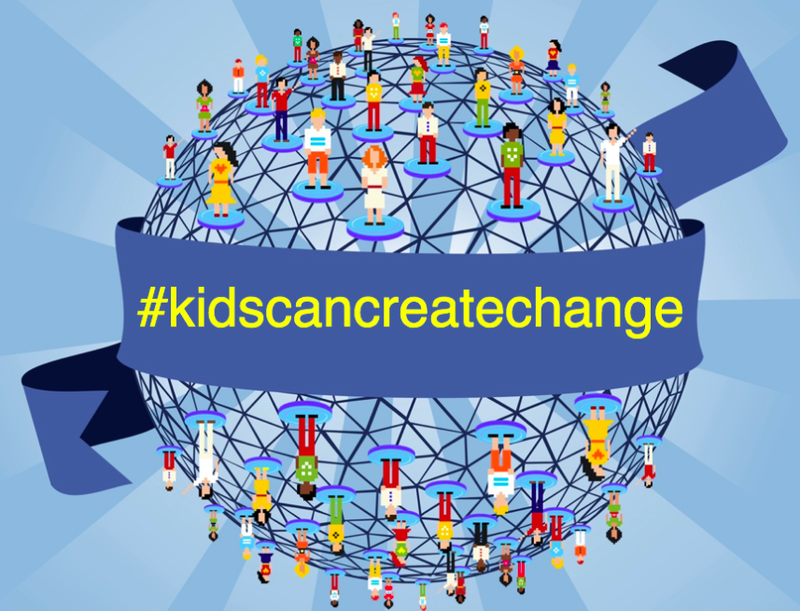 We want the world to know that #kidscancreatechange. We are asking that you identify a need in your school, community or in the world that you want to make better. Then let us know by filling in the google doc and documenting your journey with audio, text, pictures and or video. If you have an iPad, create a page using the book creator app with all of your documentation and send it to us so we can create a global collaboration book on how #kidscancreatechange. If you don’t have an iPad, we still want you to participate! Send us your documentation through email and we will create the page for you! We know that this project will take some time, we would like your documentation by April 13th so we can create the collaborative book and get it back to you before the end of the school year. If you are asking the question, “Where do I start?” We have created a google doc with some resources to get you started. When you are ready to show and tell us your journey on how #kidscancreatechange check out the following information for easy instructions on how to send us your book creator pages.